This uniquely crafted 9 carat white gold Perfect Fit bridal set is emblazoned with diamonds in an elegant cushion shape halo formation around a stunning cluster of centre diamonds. 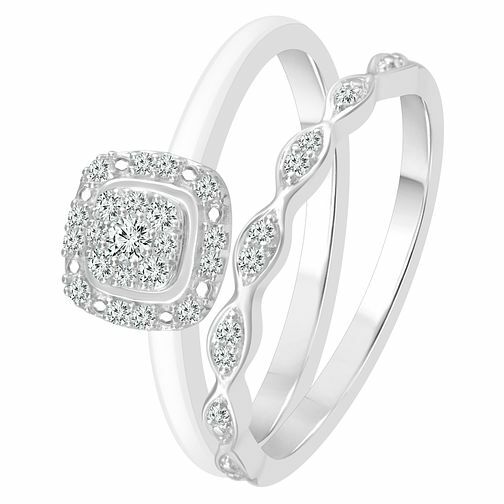 More round cut diamonds are set in the wedding band in a gorgeous beaded design, to give the perfect amount of sparkle. Perfect Fit bridal sets ensure that both of your rings will set together perfectly. This bridal set has a total diamond weight of 0.15 carat. 9ct White Gold 0.15ct Diamond Perfect Fit Bridal Set is rated 5.0 out of 5 by 1. Rated 5 out of 5 by Anonymous from Beautiful Bridal Set I have only been engaged a couple of months so cannot comment on long-term quality yet, but so far I adore the set (though the wedding band is stowed away until the big day!) it's beautiful, catches the light and sparkles all the time, for an amazing price. It is the perfect style for me, simple, but elegant.